With the rapid expansion of China’s high-speed rail network, cities that were considered far from Beijing (must-see for your best tours of China) are now only a short ride away. Taking trains that can travel up to 350 kilometers per hour, one will find China is a bit smaller than it used to be. China already has the world’s longest high-speed rail network, with about 9,300 kilometers of routes in service. The fast speed, convenience of online ticket booking, and brand-new mall-style stations for the high speed rail make riding the train enjoyable, in contrast to the formidable image associated with China’s railways of the past. As the Qingming festival holiday draws near, it’s time to plan affordable China tours on the high-speed train and explore cities not far from Beijing. As Beijing’s neighbor, Tianjin is the easiest destination for Beijingers. It takes only thirty minutes for a high-speed train to cover the 130 kilometers between Beijing South Railway Station and the Tianjin Railway Station. But be careful not to book a ticket to the newly-built Tianjin South Railway Station, or you will find yourself in the middle of nowhere and having to rely on the mercy of black-market taxi drivers. On the contrary, Tianjin Railway Station is in the center of the city next to the scenic Haihe River. Within walking distance from the station is the Italian Tourism Zone, a trendy area developed on the former Italian Concession, which is the best-preserved quarter of Italian architecture outside Italy. In this unique area you will find restaurants, bars, museums and galleries housed in historic buildings. Of special interest to some is the memorial of Liang Qichao (1873-1929), a scholar and reformist who played an important role in China's modern history (learn more about it via China guide). It may be hard to believe, but there was a time when Tianjin once contained concessions from nine countries. Although Chinese people may feel ambivalent about that period of history, the various buildings leftover from that period have become part of the city’s heritage. Stroll across the Haihe River from the Tainjin Railway Station, and you will find yourself on Jiefang Road, which used to be where Chinese and international financial institutions congregated in the late 19th and early 20th century. HSBC, Standard Chartered, Citibank, Russo-Asiatic and many other business institutions were once located along the old road. 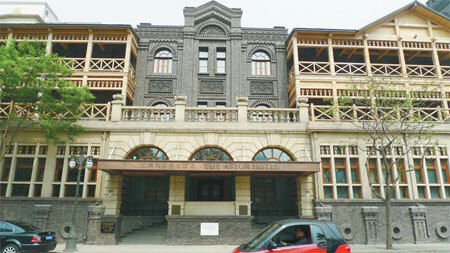 Although the companies are no longer operational in this particular area, their original buildings make the road an open museum of architecture. If your budget allows, spend a night at the Astor Hotel located on on the historic road, which was built in 1863 and boasts the first lift in China, or the Peace Hotel on the quiet Dali Road, where Mao Zedong once stayed. For the Chinese side of Tianjin, go to the Gulou area or Ancient Cultural Street to shop for traditional handicrafts. You can also eat famous Tianjin snacks like baozi (steamed stuffed buns) and mahua (fried dough twist) on what is known as Food Street. If you understand Chinese, don’t forget to go to a teahouse to watch some grassroots cross-talk performances for your popular China travel package, a Tianjin’s specialty.